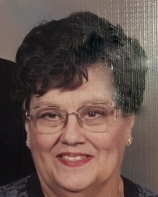 Theresa Gutierrez Ursin passed away peacefully, in the presence of her loving family, on Sunday, February 3, 2019, at the age of 81. Beloved wife of the late Jules J. Ursin. Jr. Loving mother of Jules L. Ursin III (Janine), Joseph L. Ursin (Sandy) and Mary Ursin. Adoring grandmother of Catherine Ursin, Emilie Ursin, Julie Walters and the late Jeffrie Ursin. Great-grandmother of Ariana Walters, Anniston Walters, Stella Smith and Hudson Smith. Aunt of Jerry Ursin. Theresa loved sewing and quilting. She was a retired manager of Gambino’s Bakery.